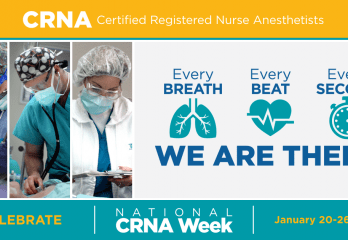 CRNAs practice in every setting in which anesthesia is delivered: traditional hospital surgical suites and obstetrical delivery rooms; the offices of dentists, podiatrists, ophthalmologists, and plastic surgeons; ambulatory surgical centers; U.S. Military and Public Health Services and Veterans Administration medical facilities. Please follow the link below for a short YouTube video! are responsible for patient safety before, during, and after anesthesia. sustain a patient’s critical life functions throughout surgical, obstetrical, and other procedures. are uniquely prepared to assess, identify, and manage the care of patients suffering from acute and/or chronic pain. select and administer other types of drugs to preserve life functions. analyze situations and respond quickly and appropriately in emergencies. provide that special spirit of caring that is unique to all nurses.